Plate Solving – SharpCap – Lunar, Planetary, Solar and Deep Sky Imaging. EAA and Live Stacking. Built in integration to plate solving applications is a powerful new feature in SharpCap 3.0. With the press of a single button, SharpCap can automatically correct your mount’s position to ensure that your GOTO target is centered in the frame. To take advantage of it you need to have a supported plate solving tool installed on your computer and have connected SharpCap to your ASCOM compatible mount. At least one of these tools must be installed and detected by SharpCap for plate solving to be available. SharpCap will look in the default installation locations for these programs and use the first one it finds. Note that it’s not enough just to install the application – you also have to install the index data at suitable scales which can add up to several gigabytes of data. Fortunately each of the programs above will guide you through the installation of the index data. All three of the plate solving tools listed above are actually just wrappers around the open source ‘Astrometry.Net’ solver, so if you are trying to choose a plate solving tool from this list, make your choice based on the UI you prefer as the actual solving engine is basically the same for all three. 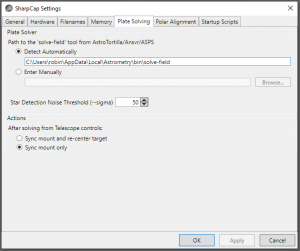 If you haven’t already connected your ASCOM mount in SharpCap, then you can begin by going to the SharpCap Settings dialog (on the File menu) and choosing the Hardware tab. The result of all this will be that the target that your mount was supposed to be pointing at when the procedure was launched will be centered when all the steps are complete. So, for instance if you use your planetarium app to GOTO M81, but it ends up off-center or even out-of-frame, pressing the plate solve button should fix the issue and get M81 into the center of your image. The notification tells you what the plate solved position was, as well as the position of the target that the mount has now been sent back to and the size of the error in pointing that the plate solving has corrected. SharpCap also includes a plate solving option for those who are not using an ASCOM mount. You can find this in the ‘Tools’ menu. This will do a whole sky plate solve and show the results in the status bar. Because the whole sky needs to be searched rather than just a small area, this option will take longer to complete. No action is taken with the result of the plate solving operation other than to display the results in the status bar. You can specify the location of the plate solving engine in case SharpCap does not detect it automatically. 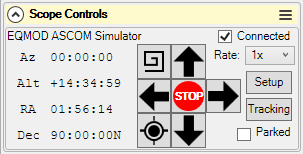 You can also set the ‘sigma’ option to the plate solver which controls star detection. Setting a lower sigma value will detect more stars at the risk of noise or hot pixels being picked up as stars. If you find that more than 100 stars are being detected then you may get quicker results by setting a larger sigma value to cut down the number of stars being used. Finally, you can choose what action SharpCap should take after using the ‘GPS’ button in the mount controls. 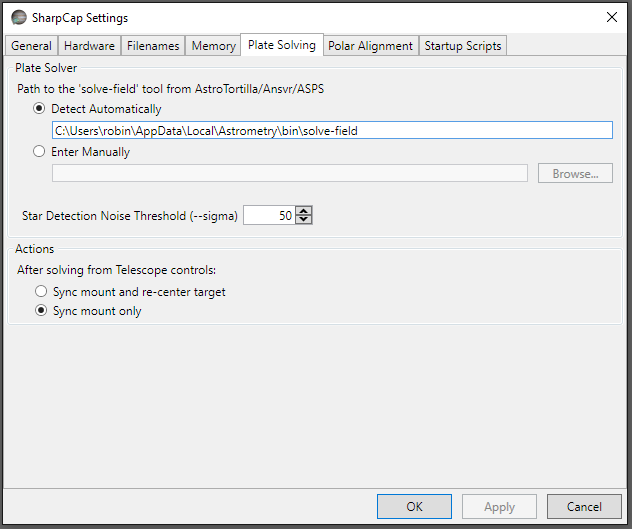 SharpCap does not use the settings that you might have configured in the UI for the different plate solving apps it supports – it has it’s own set of tested settings that it uses instead. SharpCap speeds up the plate solving process by restricting the search area to within 15 degrees of the current mount position. This means that if your mount pointing is out by more than 15 degrees, plate solving will always fail. Successful solves can often take only a few seconds, but failures take much longer as the plate solver keeps looking at more and more star combinations trying to find a match that may not exist. If the solved position is more than 5 degrees distant from the current mount position, SharpCap will ask for confirmation before proceeding. Remember that SharpCap will sync your mount to the plate solved location in order to be able to perform an accurate re-goto to the target.